A lot of the software packages I've covered in recent articles have been focused strictly on doing computations on your machine, separate from the real world. So in this article, I explore how to use your computer to design something you can build and use in the real world: your own model rocket. 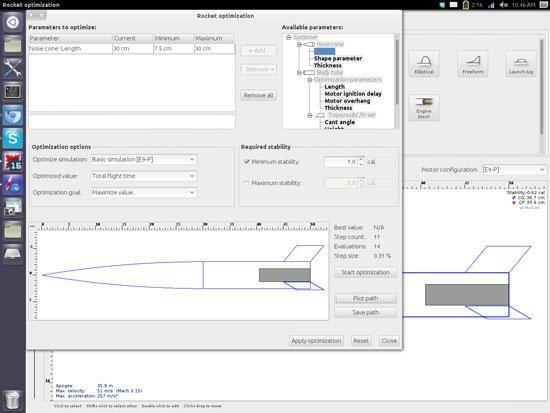 Let's take a look at the OpenRocket utility and see how it can help you design your own rockets. OpenRocket even can run simulations on your designs to show how they should behave in flight. Most distributions should include a package for OpenRocket. For example, in Ubuntu, you would install it with apt-get install openrocket. It is actually a Java program, so you always can download the jar file directly from the Web site. To run it, you need to have a reasonably up-to-date Java VM installed as well. When you first start it up, you are presented with an empty screen, ready to begin designing your first rocket. A project window pops up, allowing you to enter details like the design name, your name and design notes. You can build your rocket from a series of components. You probably will want to start with the nose cone by clicking on it from the "Add new component" window. It then will appear in the bottom section, beginning your design. You will notice that OpenRocket already begins to make calculations based on your design. You will see a small blue circle that denotes the center of gravity of your rocket. The center of gravity is the point through which all of the mass acts. There also is a small red dot that marks the center of pressure. This is the point through which all of the atmospheric forces act. OpenRocket calculates these values as you make changes to your design. You can edit almost all of the parameters for each component. There are two ways to edit these component parameters. You can double-click on the component of interest in the design window to access the edit window. There also is a list of the component layers in the top half. You can highlight the component of interest here and then click on the Edit button. What you can change will depend on which component you are trying to edit. The first component to design probably is the nose cone. 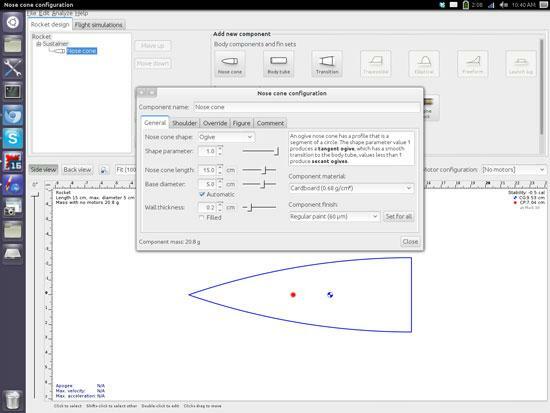 You can select what kind of profile your nose cone should have, such as conical or ellipsoid. You can set the length and base diameter, as well as the wall thickness. But, OpenRocket goes even further. You can select the kind of material from which your nose cone should be made. The different types of materials have different densities, which changes the weight of your component. Several different material presets are available, but you also can go ahead and define your own custom material type. This custom material either can be used just for one design, or you can add it permanently to your materials database if it is something you will be using over and over again. You even can set the type of finish your rocket will have. This finish can be different for each component, or you can apply a common finish to your entire rocket. When first starting OpenRocket, you get a new project dialog where you can enter details of your rocket. You can edit many details of the different components by double-clicking the component of interest. The rocket engine database has lots of information on many different brands. The next part of your rocket is the actual body tube. If your rocket is going to have a single stage, you will need only a single body tube. For multiple stages, you will need a separate body tube for each stage. Opening the edit window for the body tube allows you to change the tube length, diameter and wall thickness. You also can change the material from which the body tube is made. Because body tubes usually contain a rocket motor, you can set the motor that you want to use as well. To do so, open the edit window and click on the motor tab. You can click the Select Motor button and choose from a large selection of commercially available motors. This list of motors includes technical information, such as the thrust curve and the run times, as well as physical characteristics like the length, diameter and weight. As with the other sections of the application, you can define your own custom entries. This means even full-on DIY model-rocket enthusiasts who build their own motors can use OpenRocket to design their rockets. The component list includes other items like parachutes, shock cords, connectors and blocks, so you can design your rocket as a complete model. The final stage is to add tail fins to your rocket. As with the other components, there are well designed presets available that will satisfy most design needs. You can edit some parameters to customize the fins to some degree. 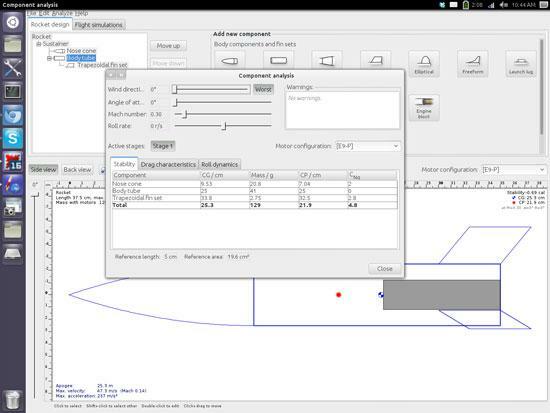 If that's not enough, there is a freehand option where you can design your fins from scratch. OpenRocket is not only a design program. You also can take your model rocket and run an analysis on it to see how it will behave in flight. The analysis section looks at individual components and shows how they affect the stability, drag and roll characteristics of your rocket. You can set parameters like wind direction, angle of attack and speed, and calculate how it will behave in flight. This is great functionality, but OpenRocket goes even further. It can take your original design and try to optimize it for the best flight characteristics. You can optimize based on altitude, velocity or some other combination of characteristics. Once you have a final design, you can run it through simulations. The simulator can apply different conditions on your rocket, like applying crosswinds or taking Coriolis effects into account, and it shows how your model rocket should behave. 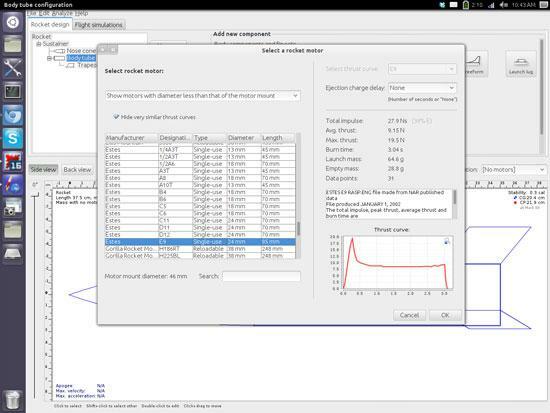 OpenRocket uses JFreeChart to plot your rocket's behavior based on the simulation results. You even can add your own code to the simulation to add extra effects. One way to do this is using Python and jPype to use Python code in the simulations. Additionally, you have the ability to write and use your own expressions in the simulator. 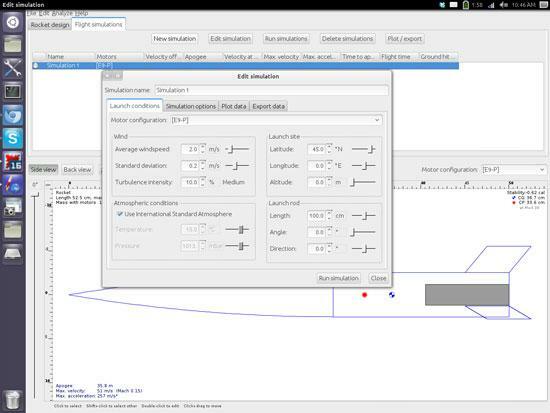 This allows you to customize the simulator to a great degree without having to add external code. Then, you can see the limits of what your model should be able to handle and how high it will go under different conditions. This is really great in helping you decide when the weather is going to be too rough for your design. You can run an analysis on the different components of your rocket. You can optimize your rocket to maximize certain parameters. You can run full simulations to see how your rocket will behave in different conditions. I have covered only the features available in the most minimal way. If you are into building and flying model rockets, your time definitely will be well spent poking around all of OpenRocket's available features. The Rocketry Forum hosts a forum where you can ask for further help. And once you have gained some experience, you can give back by helping other new rocket enthusiasts. Go ahead and design your fleet, and get yourself out into the wild frontier of space!